This PDF 1.4 document has been generated by Arbortext Advanced Print Publisher 9.0.114/W Unicode / Acrobat Distiller 9.0.0 (Windows), and has been sent on pdf-archive.com on 31/10/2017 at 09:08, from IP address 178.161.x.x. The current document download page has been viewed 122 times. File size: 425 KB (18 pages). dimension excitement, which when communicated strongly has the greatest influence on customer retention levels. Consumer energy markets are complex (Gangale et al. other’s’ customers being the prize (Walsh et al. 2006). satisfaction (Payne and Frow 1997). between a brand and its customers (Plummer 1985). practice. Existing energy research (e.g. Müller et al. market (Hanimann et al. 2015). and liberalization initiatives that reformed formerly stateowned and controlled utilities to competitive corporations. only targeted prime customers (Summerton 2004). important as customer satisfaction for customer loyalty. innovative actions either in production (Zafirakis et al. level in the second quarter of, 2013 (BBC 2013b). which we will test in this research. the brand, rather than an individual product or service. e.g. the Marlborough wine region in New Zealand. brand (Roper and Fill 2012). within the personalities of service brands. Shehu et al. behaviour or customer loyalty on a low contact service. no interaction between service provider and customer. their new tagline of ‘The Electricity Company’. is recognised for its own [brand] personality in the market’. others, for example, competence in logistics (Rutter et al. 2017b), sincerity in higher education (Rutter et al. higher price would be less desirable to consumers. positively related to consumer switching. erode trust in that brand (Beverland 2009; Eggers et al. brand authenticity, whilst customer orientation was not. effect of communication on performance. measures an energy brand’s capacity to retain customers. 7 minutes and 24 seconds reading the provider’s website. variables used in this research. The number of customers switching as a proportion of the total number of customers (churn) for each energy provider. were consistent, whilst sincerity was inconsistent. provided a list of URLs to be manually checked. pages, as detailed in Table 3. Figure 1 t–tests conducted between each dimension of each channel. independently checked by a second researcher. convert 50–60% of the documents into a digital format. companies, shown in Table 4.
textual content of marketing media (Krippendorff 2004). brand personality words associated with each dimension. most suited to the aims of this research. over a two dimensional axis (Hoffman and Franke 1986). Figure 2 using two-dimensional correspondence analysis. consistency should be interpreted independently. dimension and 13.4% (0.009) for the second dimension. two-dimensions should be interpreted independently. The data were checked for outliers using a box plot. consistency, and performance were statistically analysed. competence and ruggedness through their annual report. dimensions that the energy brands communicate strongly. Multiple linear regression was used to test hypothesis 1.
power) is fundamental to the success of a firm. subtle difference in a brand’s personality. personality strength, as communicated through the website. annual reports and websites of any electricity provider. comparison websites and consumer advice organizations. through ‘strong underlying economics and investment’. ‘the most exciting products on the market’. strongly and consistently through its marketing material. to ensure all ‘processes are complete and comprehensive’. experience […] to put across the personality behind E.
that it meets Ofgem’s’ standards. ‘detection of fraud and other irregularities’. from their ‘low price’ proposition (Brownsell 2013). and free up vital cash’. contributes to the branding literature in several ways. findings, for example of that by Swaminathan et al. brands when making high avoidance decisions. highlighted their green credentials in their annual report. of cynicism and therefore viewed as inauthentic. does not tend to fit the mainstream energy market. personality consistency, communicated via their websites. increased amount of competence in its annual report. subsequent reduction in market share. measure consistency between channels and over time. three clear managerial and practical implications. their brand personality to their customers. necessary, incremental changes should be introduced. 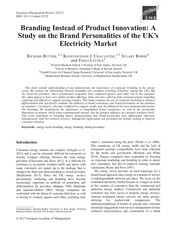 brands and brand personality into the energy sector. measured by consumer loyalty or switching behaviour. the brand personality to be from these channels. interesting and useful area for further research. ‘big six’ UK energy suppliers. Aaker, D., 1996a. Building strong brands. New York: Free Press. position/execution: The power of consistency over time”. Journal of Brand Management, 3: 251–258. brands do bad”. Journal of Consumer Research, 31: 1–16. study”. Journal of Islamic Marketing, 6: 388–405. categorical data. Springer, Berlin, Heidelberg: Springer Verlag. Service Industries Journal, 26: 633–650. corporate brand”. Corporate Reputation Review, 6: 368–374. Arruda, W., 2009, “Brand communication: The three Cs”. Thunderbird International Business Review, 51: 409–416. Balmer, J. M. T., 2013, “Corporate brand orientation: What is it? What of it?” Journal of Brand Management, 20: 723–741. Journal of Marketing, 35: 441–456. advertising. Hillsdale, NJ: Lawrence Erlbaum Associates. energy-market-makes-it-easy-for-big-six-to-hike-prices-saysnew-study-9001778.html (accessed 20 October 2015). firms&quot;. Available from http://www.bbc.co.uk/news/uk-politics24706853 (accessed 20 November 2013). BBC, 2013b. &quot;Electricity switching numbers at record low&quot;. (accessed 21 November 2013). Available from http://www. Berelson, B., 1952. Content analysis in communication research. iconic brands. London: Palgrave Macmillan. consumer trust in energy firms. marketing magazine, 2014. 1316013/sse-creates-cgi-orangutan-bid-reinstate-consumertrust-energy-firms (accessed 1 January 2015). loyalty?” Journal of Marketing, 73: 52–68. sport: Dimension analysis and general scale development”. Sport Marketing Quarterly, 19: 8–16. Nonprofit and Voluntary Sector Marketing, 8: 134–142. CourseMate with eBook Printed Access Card) 1st Edition. Brownsell, A., 2009. &quot;EDF Group plots ‘leader’ identity&quot;. marketingmagazine.co.uk/article/897123/edf-group-plotsleader-–identity (accessed 25 November 2013). identity&quot;. Marketing Magazine,. Available from http://www. marketingmagazine.co.uk/article/1096711/british-gas-setmodernise-brand-identity (accessed 25 November 2013). de Chernatony, L., 2010. Creating powerful brands. Routledge. consumer confusion”. Management Science, 59: 2450–2469. marketing research. Fort Worth, TX: Dryden Press. D8, 2015. &quot;ScottishPower: Case study&quot;. Available from http://d8. uk/case-studies/scottishpower (accessed 15 May 2015). Daglish, T., 2016, “Consumer governance in electricity markets”. through stories”. California Management Review, 49: 82–100. Eggers, F., M. O’Dwyer, S. Kraus, C. Vallaster and S.
phenomenon”. Journal of Consumer Psychology, 7: 131–157. perceptions”. International Marketing Review, 27: 164–178. engagement: An insight from smart grid projects in Europe”. Geuens, M., 2004, “Editorial: Strategic brand communications”. Journal of Marketing Communications, 10: 69–71. energy markets”. The Economic Journal, 115: 949–968. for service attributes”. Energy Journal, 21: 1–28. Greenacre, M., 2010. Correspondence analysis in practice. personality on consumer responses to persuasion attempts”. Journal of Brand Management, 20: 518–530. image and cosmetic usage on perceptions of brand personality”. “British gas: Options for privatisation”. Fiscal Studies, 6: 1–20. impact of energy branding”. Energy Policy, 35: 2661–2672. concern”. Journal of Business Research, 65: 1254–1263. websites”. Energy Policy, 66: 257–266. storytelling”. Journal of Public Affairs, 2: 57–70. Holmes, A., 2016. Commoditization and the strategic response. House of Commons Work and Pensions Committee and T.
Wynne, Helen Goodman MP. London: Stationery Office. participatory approach to the brand building process. Chichester: John Wiley &amp; Sons. leader&quot;. Available from http://www.interbrand.com/en/ourwork/EDF.aspx (accessed 25 November 2013). 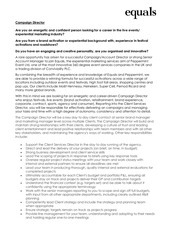 en/best-global-brands/best-global-brands-methodology/BrandStrength.aspx (accessed 25 September 2012). products in Germany”. Energy Policy, 53: 311–322. Creating and sustaining brand equity long term, 4th ed. research”. Journal of Consumer Research, 4: 8–18. King, S., 1970. What is a brand. London: J. Walter Thompson. prices&quot;. BBC. Available from http://www.bbc.co.uk/news/ukpolitics-24213366 (accessed 17 July 2017). road to renaissance. London: Taylor &amp; Francis. of Consumer Behaviour, 10: 290–303. countries”. The Journal of Brand Management, 12: 325–338. BBC. Available from http://www.bbc.co.uk/news/business39694183 (accessed 17 July 2017). of Product &amp; Brand Management, 24: 518–536. private consumption”. Energy Policy, 35: 4283–4294. attitude”. Journal of Marketing Communications, 18: 189–202. retying connections”. The Electricity Journal, 11: 17–22. Opoku, R., L. F. Pitt, M. Hultman, R. Abratt and S.
Communication of brand personality by African countries”. Journal of Public Sector Management, 16: 75–100. of Marketing Management, 29: 69–85. marketing”. Journal of Brand Management, 24: 1–19. Pitt, L. F., R. Opoku, M. Hultman, R. Abratt and S.
Plummer, J. T., 1985, “How personality makes a difference”. Journal of Advertising Research, 24: 27–31. Richards, P. and E. White, 2014. Simplifying energy tariffs. House of Commons Library: SNSC–6440. communication. London: Pearson Higher Ed. personality?” Journal of Political Marketing, 1–20. https://doi. performance”. Journal of Business Research, 69: 3096–3104. review”. Journal of Consumer Research, 9: 287–300. the corporate brand: An impression management perspective”. Journal of Product &amp; Brand Management, 22: 491–501. A note on generalizing personality across services contexts”. Journal of Services Marketing, 25: 467–474. Communications: An International Journal, 9: 57–69. and validation”. Psychology &amp; Marketing, 32: 121–132. styles”. Journal of Consumer Research, 35: 985–1002. Contemporary Management Research, 10: 58–78. Is it a matter of gender?” The TQM Journal, 26: 75–87. Germany”. Journal of Services Marketing, 20: 412–420. perspective”. Marketing Intelligence &amp; Planning, 20: 394–404. in Europe: Rebalancing burden sharing with energy storage”. This file has been shared by a user of PDF Archive. Document ID: 00691297.